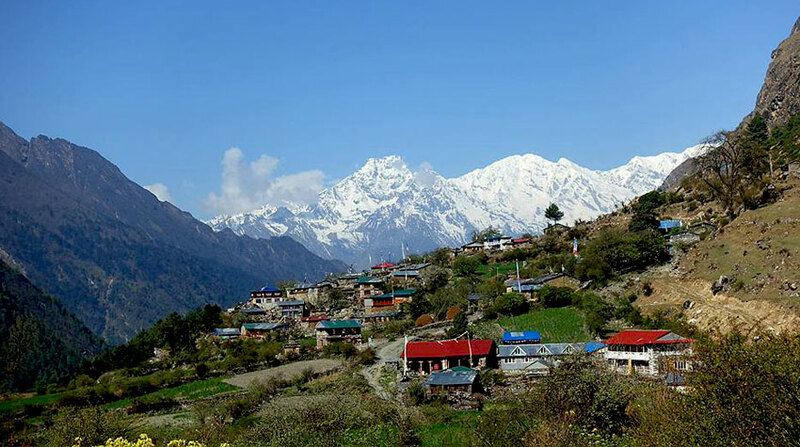 Manaslu Tsum Valley Trekking is the marvelous trip to experience the hidden culture of both Nepalese and Tibetan in the restricted remote area of Nepal. The trail provides an equal opportunity to observe the diverse flora and fauna found from the sub-tropical regions to the high Himalayan territory. Stunning views of towering mountains like Himalchuli (7,893 m), Boudha Himal (6,672 m), Ganesh Himal (7,429 m), Sringi Himal (7,187 m) including the eight highest mountain of the earth Mount Manaslu (8,163 m) are the treasure of this region. Tsum Valley was just opened in 2008 for foreigner tourist. Similarly, after the teahouses were built in the Manaslu Circuit region it became popular among the traveler. The government of Nepal has kept Manaslu Circuit Region as a restricted area. To enter into this region, a special permit is required. Without this permit, it is strictly prohibited to visit this place. All these reasons help to preserve the ancient religion and tradition of the people sheltered within this area. Consequently making the Manaslu Tsum Valley Trek less crowded and unspoiled trekking route of Nepal. In this trip, you will be exploring both Tsum Valley Trek and Manaslu Circuit Trek route together. The journey to this challenging and pleasing trek starts with a seven hours drive from Kathmandu to Sotikhola. From here follow the Manaslu Circuit Trek path up to the Jagat village. Afterward, divert the route to the Tsum Valley. The trail will pass through the Budhi Gandaki River, beautiful waterfalls, rocky trail, Gurung village, suspension bridge, hot spring, stone stairs, Pine and Rhododendron forest till the Mu Gompa. Observe the Tsum Valley and monastery surrounded by giant white Himalayas and descend down to the Deng Village. From here the route again joined with Manaslu Circuit Trekking. Cross the challenging part of this trip Larkya La Pass and exit the trek from Bhulbhule (a part of Annapurna Circuit Trek). Day 08: Trek to Mu Gompa & back to Rachen Gompa. Day 09: Trek to Chumje. Max. Altitude: 3,230 m (Chumje). Day 10: Trek to Bihi. Max. Altitude: 3,130 m (Bihi). Day 11: Trek to Namrung. Trail Attractions: Mani Walls, view of Siringi Himala, and Monasteries. Max. Altitude: 2,630 m (Namrung). Day 12: Trek to Samagaon. Trail Attractions: views of Siring Himal, Ganesh Himal, Mt HimalChuli, Mt. Manaslu, and Ribung Gompa. Max. Altitude: 3,530 m (Samagaon). Day 13: Visit Pungyen Gompa. Trail Attractions: Mani Stones, Sherpa's Traditions, and visit Pungyen Gompa..
Day 14: Trek to Samdo. Max. Altitude: 3,860 m (Samdo). Day 15: Trek to Dharmasala. Trail Attractions: Wooden Bridge and Larkya Glacier. Max. Altitude: 4,460 m (Dharmasala). Day 16: Cross Larkya La Pass & Trek to Bhimtang. Trail Attractions: views of Cho Danda, Larkya Peak, Himlung Himal, Cheo Himal, Kangguru, and Mt. Manaslu. Max. Altitude: 5,160 m (Larkya La Pass). Day 17: Trek to Dharapani. Trail Attractions: views of Mt. Manaslu, Lamjung Himal, Himlung Himal and Cheo Himal, and Rhododendron Forest. Max. Altitude: 1,860 m (Dharapani). Day 18: Trek to Jagat. Trail Attractions: Dudh Khola, Marshyangdi Khola and waterfall. Max. Altitude: 1,300 m (Jagat). Day 19: Trek to Bhulbhule. Max. Altitude: 840 m (Bhulbhule). Day 20: Drive back to Kathmandu. Drop to your hotel. Manaslu Tsum Valley Trek finished here! Bhulbhule to Kathmandu by sharing Bus. Annapurna Conservation Area Project Permit (ACAP). Trekker's Information Management System Permit (TIMS). Wants some modification on Manaslu Tsum Valley Trek itinerary? contact us to customize it.